Introduction of the products The PAN series is an automatic constant voltage/constant current shifting regulated DC Power supply equipped with the phase control pre-regulator. A series regulator system is used to assure low-noise and stable output. 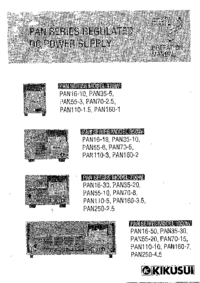 The PAN series are featured with the following points. •	The two distinctly visible LED display units on the front panel display output voltage, output current and various preset data. •	The output control potentiometer (for voltage and current presetting) is of a 10-turns wire-wound design, and allows precise setting. •	Electronic switch for low chattering and noise is used to turn on and off the power output. •	Using external voltage or external resistor, output voltage and current can be remote-controlled. With the GPIB Interface available with our PIA3200, an automatic testing system can be formed. •	The phase control pre-regulator is furnished with a choke input smoothing circuit, which decreases apparent input power and suppresses harmonic components in the input current. Therefore, potential effects on the power line, such as input voltage distortion, are decreased. •	High-speed transient response of 50 j± s allows it to follow a sudden load change. •	Carefully selected parts, improved circuit, and forced air cooling heat dissipation combine to produce an excellent low temperature drift of 100 ppm/°C (constant voltage characteristic). •	To protect a load from unexpectedly excessive voltage, the unit includes a built-in OVP (over-voltage protection) circuit capable of handling voltages 10-110% of the rated output voltage. With the above-mentioned features, PAN series units offers a wide range of applications to laboratory experimental equipment, test equipment for mass-production lines, power supply for aging, etc. This manual is arranged as follows. An outline of each chapter is given below. 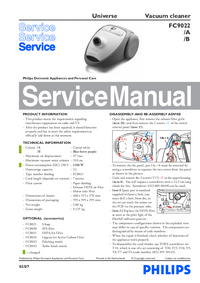 Preface Describes all the models covered by this manual, as well as outlines the features of each model. Chapter 1 Setup Describes the necessary procedure from unpacking to preparation before use. Since details on installation location and Power supply are provided, be sure to read this chapter before using the unit for the first time. Chapter 2 Basic Operation Describes the unit's start-up function, protection circuit, and the basic operations managed from the front panel of the unit. Chapter 3 Applied Operation Explains the remote control of the unit, and use of multiple number of Power supply in combination to increase output capacity. Chapter 4 Names and Functions of Controls Provides an outline of the switches and terminals on the panels, including their names and functions. Read this chapter to learn the meanings of the ZLcaution marks indicated on thé panels of the unit. Chapter 5 Maintenance Describes the daily inspection procedures and the calibration conducted when necessary. To remote-control the unit, such calibration is necessary. Follow the calibration procedures detailed in this chapter. Chapter 6 Specifications Describes the electrical, mechanical and general specifications of the unit.